I don’t know what inspired this cake, but I made it for Riley’s birthday one year. Combine cocoa and boiling water, mix well and leave to cool. Preheat the oven to 350 degrees. 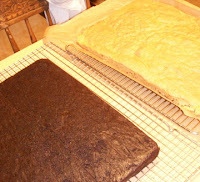 Line a 10x15 inche baking pan with at least a one inch side with parchment paper. Combine the dry ingredients. Cream the butter and sugar in electric mixer until nicely combined. Add the eggs and beat until a lovely fluffy pale yellow mixture. With mixer running on a low setting add the dry ingredients alternately with the cocoa mixture. Pour into the prepared pan and smooth out. Bake for 25 minutes. Let cool for about 15 minutes, then carefully lift from the pan and place on a cooling rack. Preheat oven to 325 degrees F. Prepare the 10x15 inch pan as above. Beat the egg whites until soft peaks form, then gradually add the sugar and peat until good and firm. Set aside. Combine the dry ingredients. Beat the egg yolks until fluffy, and then slowly add the oil. Add the almond extract and orange flower water. Then add the dry ingredients alternately with the orange juice. The mixture will seem a bit stiff. Fold in the egg whites. Pour into the prepared pan and smooth out. Bake for 25 minutes. Let cool for about 15 minutes, and then lift out to a cooling rack. and microwave about a minute. Stir to dissolve, and then add the brandy. and spoon the hot syrup all over the cake. In a microwavable bowl, put the semi-sweet chocolate, butter and cream, and place in microwave for about 2 minutes. After taking out of microwave stir until everything looks melted and well mixed. If not so, put back in microwave for a little bit. When well mixed, add to the icing sugar in an electric mixing bowl and continue to whip until very smooth. It will be runny looking. Just leave the beaters in the mixture, cover with plastic wrap and put into the refrigerator or freezer until very solid, but not frozen. When the mixture is ready, put the bowl back on the mixer and with a good grip on the bowl, whip until very smooth and spreadable. The mixture will turn from dark brown, to a very pale brown. Cut the two cakes in half the long way. Find some sort of serving plate to put it on. 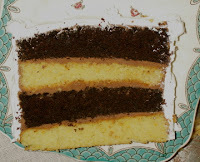 I put the butter cream mixture between the layers of the cake, alternating chocolate cake and the orange cake. Then put a very light coating all over the cake and put the cake into the refrigerator until ready to be served. Put the whipping cream into an electric mixing bowl, add the beaters and put into the freezer for about 10 minutes. Remove from freezer and beat, adding the vanilla and sugar. Make the cream stiff, but not butter. If you like reserve about a cup of whipped cream for piping. With the remainder cover the cake. Then pipe if desired. This is a huge cake and should easily serve 24 people.